Copyright 2012 The Author - The University is continuing to endeavour to trace the copyright owner(s) and in the meantime this item has been reproduced here in good faith. We would be pleased to hear from the copyright owner(s). The use of e-learning in higher education contexts has continued to expand since its inception, impacting significantly upon access to higher education. Student engagement is similarly emerging as a focus in higher education, as engagement is a prerequisite for effective learning. 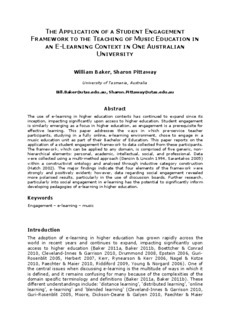 This paper addresses the ways in which pre-service teacher participants, studying in a fully online, e-learning environment, chose to engage in a music education unit as part of their Bachelor of Education. This paper reports on the application of a student engagement framework to data collected from these participants. The framework, which can be applied to any domain, is comprised of five generic, nonhierarchical elements: personal, academic, intellectual, social, and professional. Data were collected using a multi-method approach (Denzin & Lincoln 1994, Sarantakos 2005) within a constructivist ontology and analysed through inductive category construction (Hatch 2002). The major findings indicate that four elements of the framework were strongly and positively evident; however, data regarding social engagement revealed more polarised results, particularly in the use of discussion boards. Further research, particularly into social engagement in e-learning has the potential to significantly inform developing pedagogies of e-learning in higher education.